Thank the Mill Bay Community League, an organization ahead of its time. I think everyone would agree Mill Bay is a wonderful place to live but did you know that many of the things that make our community the great place it is, are thanks to the efforts of the Mill Bay Community League. Since its inception in 1945 the Community League has taken an active role in all district activities and worked tirelessly to make Mill Bay a better community for everyone. 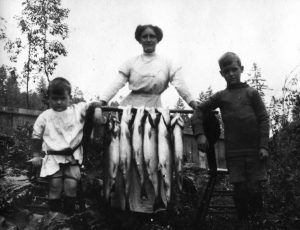 It was thanks to the Community League, that Mill Bay developed an environmental conscience way ahead of its time. From early days it was decreed that beaches be open to the public for recreation. 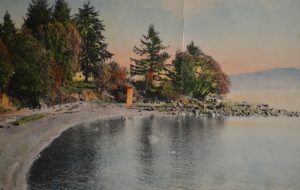 However some individuals, when buying waterfront property, felt they owned the foreshore as well and by the 1940’s there were several infringements. One of the first duties of the Community League was to dispute their claim. The League applied to the provincial government to ensure this law be enforced and that the foreshore be designated a Recreation Area. An Order-in-Council was implemented to this effect, but, in 1986, the government decided it was an unnecessary ruling and the order was rescinded. However, most of the foreshore remains open to the public. Many years ago the provincial government saw fit to spray the weeds along the road. This not only created a fire hazard but the poisonous spray drifted far and wide affecting people as well as their gardens. The League had this stopped. Another project from the past dealt with garbage. At that time people took their refuse out in a boat to dump it off shore. The beaches were littered with plastic bleach bottles and other refuse. Other people dumped their rubbish along trails in the bush which drew wild animals, particularly rats. The Community League looked at several spots for a dump, the most likely place being a gully on the Deloume property (now the site of Mill Springs residential development). The Community League then leased the land for $5 a year. This site was approved by the Department of Health and served the purpose for some time. But unfortunately users were careless, scattering trash around the edges of the hole; some emptied the contents of incinerators, causing dangerous fires. Finally a public garbage pick-up was started and the dump was closed. In 1958 the League undertook to build a tennis court as its Centennial project. With the help of many willing workers the site was graded and a concrete surface laid and later fenced. A tennis club was started and it still going strong to this day. Learn more about the Mill Bay Community League’s efforts on behalf of the community in the next issue of South Cowichan Life and in the meantime please become a member of the MBCL and support your community. January 1, 1922 was a good day to stay home!!!! On December 31, 1921 the BC Government changed driving from the left side, like that in England, to the right side of the road.